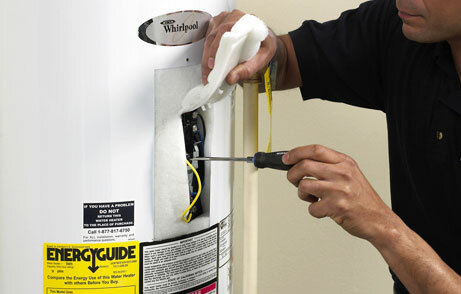 Spend Less on All Gas and Electric Water Heater Repair, Replacement, and Installation Services in Santa Clarita, CA. It’s true. Water heater problems always arrive at the least opportune time when you don’t have the time or money to repair the problem. At Santa Clarita Plumbing Service Pros, we get it. We know that dealing with a broken electric or gas water heater is no fun and can put a kink in your day as well as your finances. For these reasons, we make it our mission to be available 24 hours a day, seven days a week, and on-call for you to provide emergency services in Santa Clarita, CA. When trouble strikes, don’t run away. Instead head for the phone and give us a call. Not only do we respond fast to your calls for help, but our certified technicians are the best-trained in the industry. Our electric and gas water heater technicians participate in continuing education classes on an annual basis at our onsite training facility, logging over 100 hours of additional education. When you hire a Santa Clarita Plumbing Service Pros technician, you can feel confident that you are dealing with a professional that will deliver fast, precise, and friendly water heater repair and replacement services for you. With Santa Clarita Plumbing Service Pros’ services also comes up-front pricing. We don’t believe in surprising our customers with unexpected final bills. We price our repair services by the job instead of by the hour like other plumbing companies in town. Up-front pricing saves you money. It’s really that simple. Before any aspect of your water heater repair or install is completed we will provide you with an accurate quote for service. This estimate is the actual price of repairs. You’ll never pay a cent more. When you need electric or gas water heater repair or replacement services in Santa Clarita, you can put your worries aside. Santa Clarita Plumbing Service Pros offers worry-free, expert service that is always just a phone call away. No matter what the problem may be, you can be sure that our team of experts will never leave you guessing. We promise our customers will have a hassle-free, 100% guaranteed pleasant experience when we arrive, at your home, to provide water heater repair and replacement services. Pick up the phone and learn more about our flexible scheduling, emergency services, and ironclad warranties.